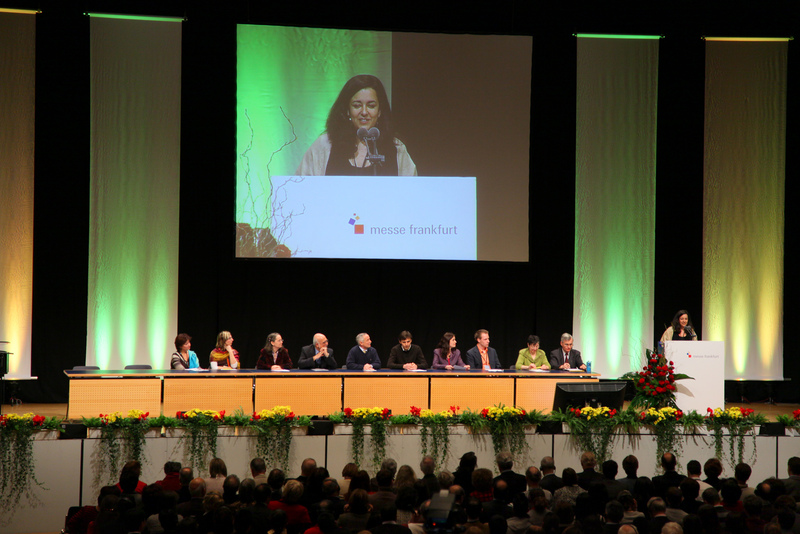 More than 4,600 people – double the number initially anticipated – gathered in Frankfurt for the largest ever Baha’i conference in Germany. 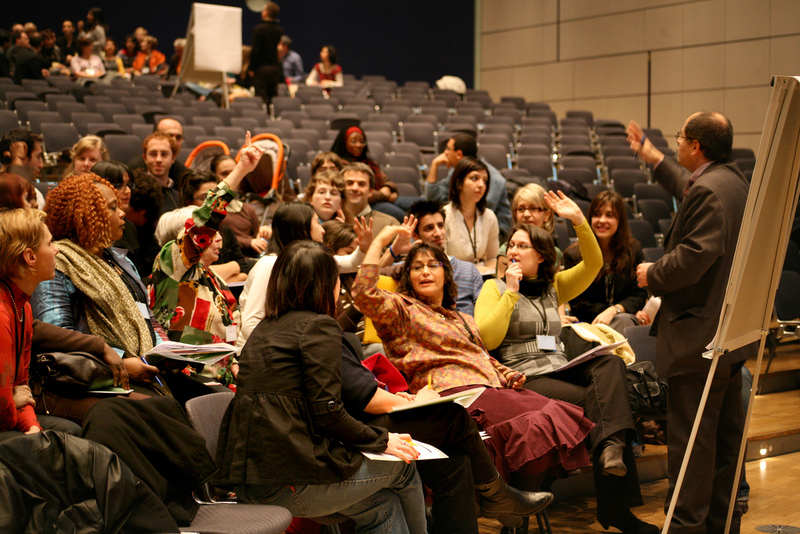 The event took place in the Congress Hall of the Messe Frankfurt complex, the world's third largest trade fair venue. As the preregistration numbers outgrew the original room that had been booked, planners added a second hall, then a third. 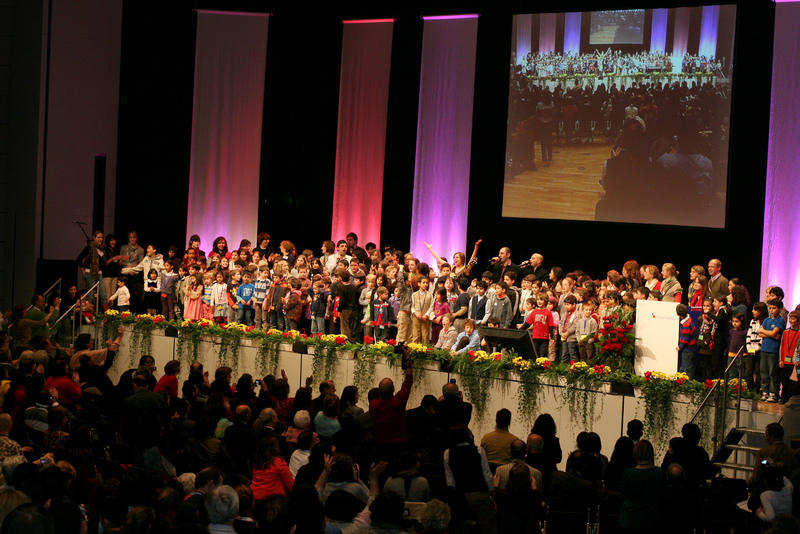 Almost 2,000 participants came from Germany, 800 from France, and 350 each from the Netherlands and Switzerland. Others came from Austria, Belgium, the Czech Republic, Hungary, Kosovo, Liechtenstein, Luxembourg, Macedonia, Poland, Serbia, and Slovakia. Most of the 69 participants from Hungary traveled to Germany together on one bus, with Baha’is from Slovakia joining them at a stop in Vienna. Thirteen people from Kosovo were able to attend, with two Kosovan Albanians trying for weeks to get a visa and finally managing to do so one day before the conference started. The purpose of the conference was to celebrate achievements in community-building activities and make plans for future work. 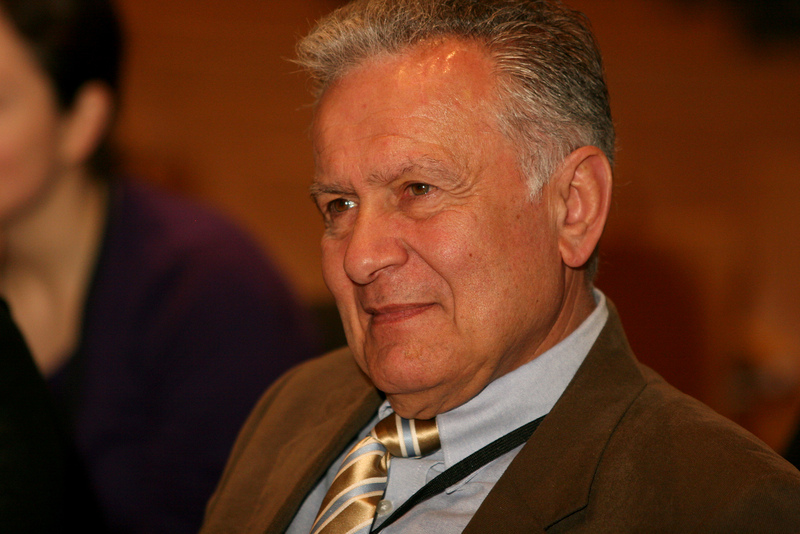 The importance of every individual playing his or her part in a united effort to build a vibrant community life was stressed in opening remarks by the chair of the National Spiritual Assembly of the Baha’is of Germany, Dr. Hans-Martin Noltenius. The Universal House of Justice was represented at the conference by Mr. Stephen Birkland and Mrs. Joan Lincoln, both members of the International Teaching Center. Their presentations included reports from Baha’is relating personal experiences in initiating and sustaining activities at the local level – stories that helped demonstrate how capacities can be nurtured in people to contribute to the advancement of their communities. 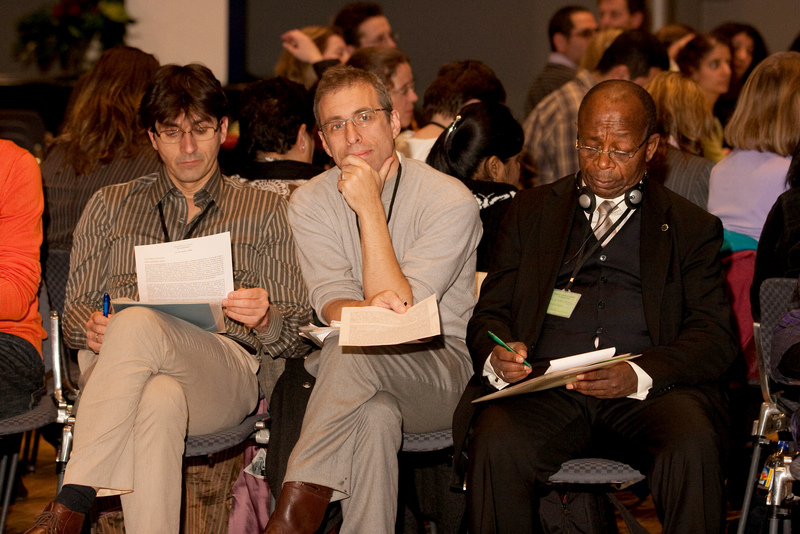 Many of the conference participants were people who have only recently come into contact with the Baha’i community and joined the activities. Moise Alexis, a 23-year-old law student from Guadeloupe who now lives in France, told how he first heard of the Baha’i Faith when Baha’is visited his home and shared an introductory presentation. “I started to feel the need to be part of a project, to believe in something greater,” he said. Eventually he took part in educational courses organized by Baha’is and now enthusiastically serves young people in Creteil on the southeastern outskirts of Paris. “I had the feeling that everyone can change the world if you want to do it and want to take the first step,” she said. 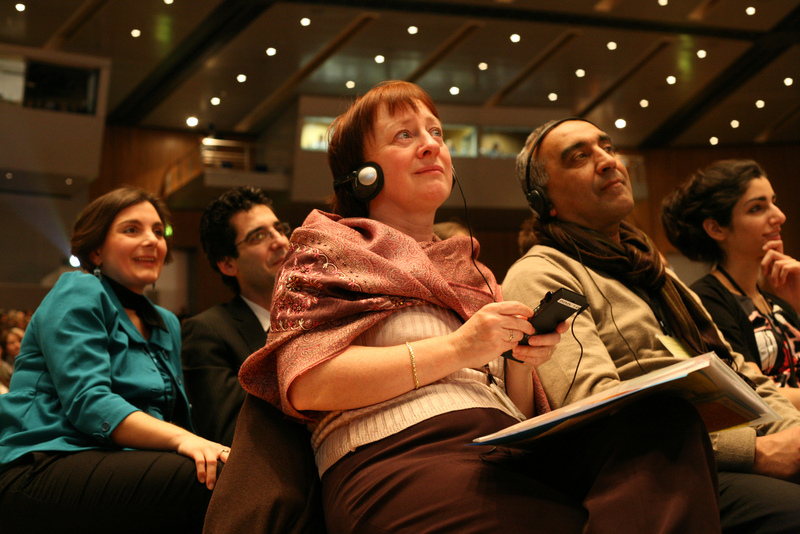 The conference proceedings were in English with simultaneous translation offered in German, French, Czech, Polish, and Hungarian. Supplementary activities to the conference were planned at the Baha’i House of Worship 25 kilometers west of Frankfurt at Langenhain. The day before the conference opened, special transportation shuttled people from the Congress hall to the temple for four separate devotional programs. For many of the attendees, it was their first visit to the house of worship, and they represented one of the largest and most diverse groups ever to join there for prayers. Another feature of the gathering were the references to 1958, when Frankfurt hosted another landmark conference – one of the intercontinental conferences held at the midway point of another Baha’i plan, the 10-year initiative launched in 1953 by Shoghi Effendi, the Guardian of the Baha’i Faith. 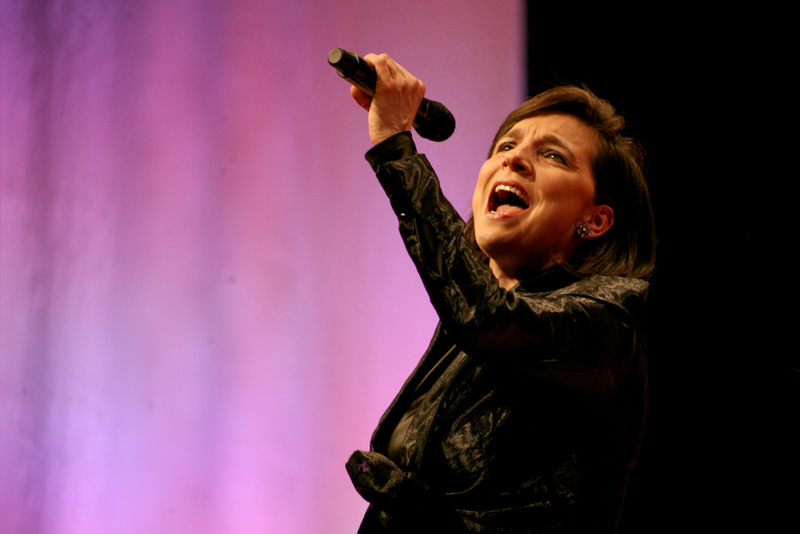 Among the attendees at this year’s gathering were at least nine people who participated in the earlier event. They noted that in 1958, Baha’is from Iran were free to travel to such a gathering – at this conference, they were represented by red roses placed at the front of each of the auditoriums. Cultural diversity was the hallmark of the two-hour program on Saturday evening which featured Tunisian-born singer Atef, choral versions of the Baha’i scriptures sung by the German choir Voices of Bahá, folk dances performed by eight young people studying at the Townshend International School in the Czech Republic, specially commissioned jazz settings of Baha’u’llah’s writings, and classical music performances that included an orchestra of young Baha’is in their teens. 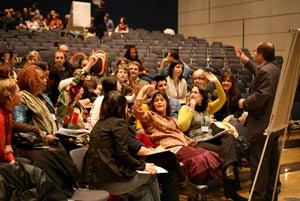 A key feature of the second day comprised the workshops dedicated to the planning of activities in specific communities. Nearly 300 people offered to travel regularly – or even move – to communities other than their own, in order to help establish core activities. The 273 children attending the conference attended their own devotional program at the house of worship on Sunday morning. Some of them recited prayers for the Baha’i children of Iran, many of whom face expulsion from school or other difficulties. 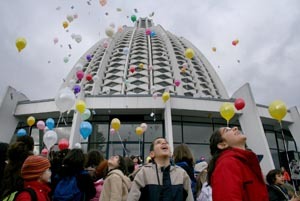 The group released 250 helium-filled balloons from the temple grounds before returning to the conference to perform a song on the main stage. Video: Sights and sounds from the Frankfurt conference. The main auditorium accommodated 2,200 people, while others watched via video link from two auxiliary rooms. Shown here are Christine Sadeghi Guerif and Sohail Sadeghi, both of France, and Jasmin Ettehadieh of Austria. Behind them are Katrin and Habbib Modabber of Germany. Eleven countries gave reports on activities in their jurisdiction. 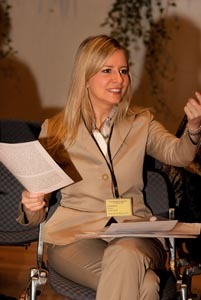 Here, Dr. Nadi Towfigh of the National Spiritual Assembly of Germany reviews developments over the past two and a half years. Some 4,600 people attended the gathering. The main proceedings were in English, with simultaneous translation offered in German, French, Czech, Polish, and Hungarian. On the first day of the conference, participants divided into 56 workshops to study and reflect on the messages from the Universal House of Justice. 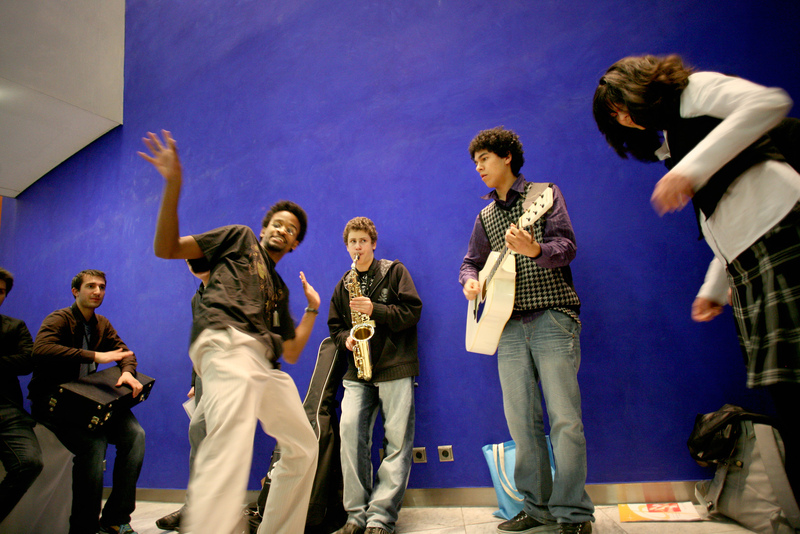 Youth from France make music in the foyer during a break. At the Saturday night cultural program, Angelika Gors of Germany performed a jazz piece called “One Common Faith,” composed for the conference by Peter Held. Kamal Mazloumi of Germany, in the red vest, was among the performers on Saturday evening. At left, with his back to the camera, is Atef, a singer from Tunisia now living in France. The gathering took place on the 15th of 18 consecutive weekends of regional conferences being held in 41 cities around the world. Breakout sessions on Sunday gave people a chance to consult on plans for specific communities. This group is from France. The current series of conferences began in November in Lusaka, Zambia, and will conclude on the first of March in Kiev, Ukraine. 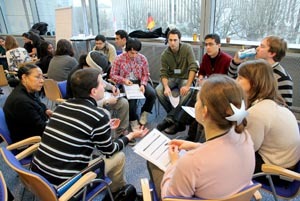 Consultation in the Sunday workshops resulted in plans to establish intensive programs of growth in 14 different places. 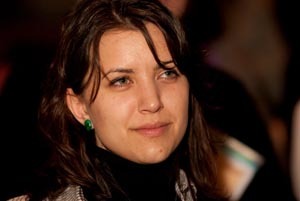 Rachel Bayani of Belgium serves as facilitator of a workshop. 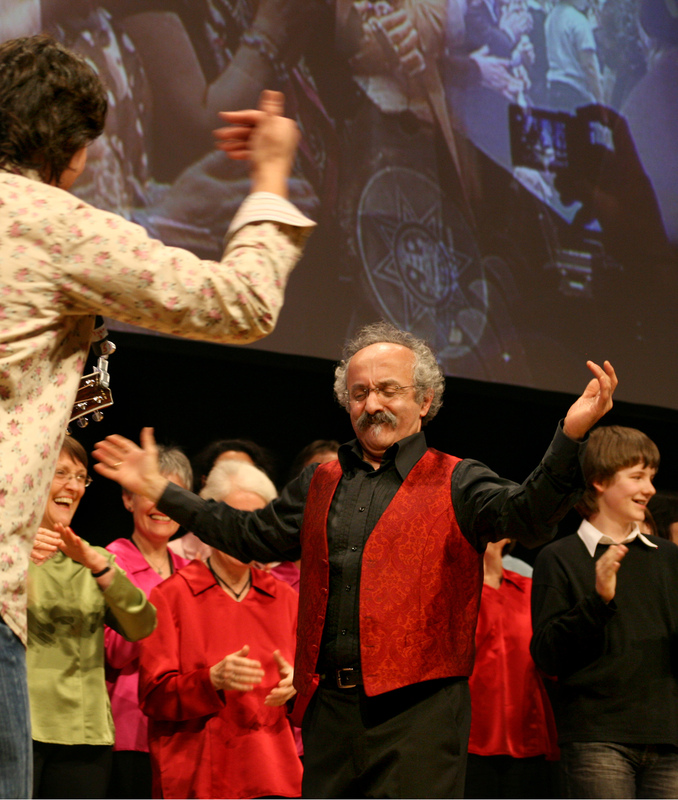 The conference was the largest Baha’i gathering ever held in Germany. The number of participants was double the number that attended an intercontinental conference in Frankfurt in 1958. 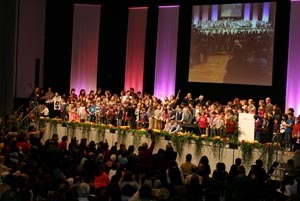 The children had a special program on Sunday at the Baha’i House of Worship at Langenhain, outside Frankfurt, before returning to the conference site for a final presentation. The children made a presentation during the final session and brought the audience to their feet with the applause.